May 7, 2013 by LindaJoy Rose . Posted in " Condiments, Featured, Health, Miscellaneous, Nutrition, Raw Fusion Solution, Recipes, Sides, Snacks, Tips & Tricks " . Tags " appealing condiments, ingredients, nutritional condiments, pantry items " . Dr. Oz, when asked what he thought of eating mainly raw foods, made this statement: “There are immeasurable benefits to maintaining a raw foods diet”. I can vouch for that! But if you dissect what Dr. Oz said, let’s key in to the word maintaining; While eating primarily raw and living foods will have an amazing effect on how you look and feel, it’s not an easy lifestyle to sustain over time. That’s why “mixing it up” a bit is so important. Having a few Raw Fusion pantry items on hand definitely optimizes your sustainability. They make your dishes more exciting and appealing. And these ingredients also have some great nutritional benefits. Umeboshi (also spelled umebyoshi) or salted plums, come from Japan; The vinegar a combination of sour salted plums, sea salt and shiso leaves and the resulting vinegar is sour,, salty and a bit fruity. 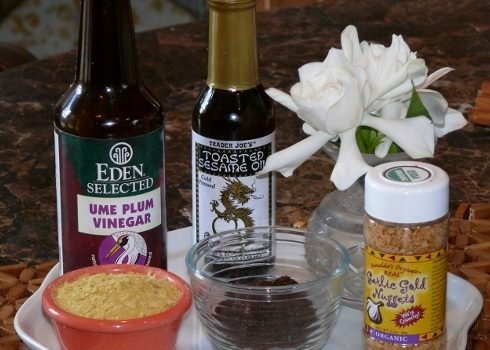 It is one of the most alkalizing ingredients on the planet (one of the recommended pantry items for our “food group therapy” Alkalinity Challenge) If you are sensitive to soy products try using this vinegar as a substitute. 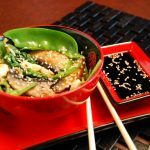 Sesame is very soothing to the system and adds an appealing flavor to both sweet and savory dishes. Toasted sesame oil has a deep flavor and aroma that makes your food fragrant and ultra-appealing. A little goes a long way — add a dash to soup broth, stir fries and any Asian-inspired sauces or dressings. Hint: Use as a substitute for Parmesan cheese over pastas (like this Cheezy Zucchini Spaghetti Dish) or casseroles. I also love making a paste of nutritional yeast and flaxseed oil and spreading over dehydrated crackers. (in glass bowl) Miso is a fermented paste made from soybeans, barley or chickpeas that adds a hearty flavor to dressings, dips and patés. The process of fermenting soybeans makes their innate protein more digestible due to the enzymatic benefits. Soybean miso comes in several varieties from a lighter, sweeter flavored one (often called “mellow”) to a dark red type that has a richer, saltier taste. Miso keeps for quite a long time in the refrigerator; it’s a condiment that I am rarely without because it is can be the secret ingredient in transforming recipes. Technically, miso is not a raw product as it has been cooked. Buying unpasteurized miso is recommended so that the enzymatic benefits have not been lost through the heating process. If you are sensitive to soy, look for the chickpea or barlety varieties. 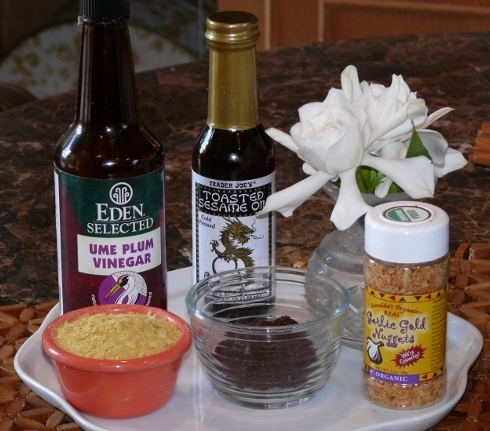 Hint: Red miso is a vital condiment in my Raw-Fried Sunflower Beans and Angel’d Eggs. Mash 1 TB. white (mellow) miso with 1/2 avocado for one of the most exciting dips you will ever taste! One of my favorite condiment items for adding a crunchy texture. There are some dishes that become much more interesting with a bit of added texture. Salads taste crunchier and cauliflower mashed “potatoes” more like restaurant-style garlic mashed potatoes with a few sprinkles of these yummy nuggets. Garlic Gold by Rinaldi sells them in a shaker bottle and also in olive oil, but I think it’s smarter and less expensive to buy the dry shaker bottle version. While raw garlic is unbeatable for it’s nutritional benefits, sometimes I prefer the roasted flavor and crunchy texture. Here’s a recipe that uses all 5 of these ingredients! Directions: Place all of the ingredients (except nutritional yeast) in a blender or food processor and blend until smooth. Adjust seasonings to taste. 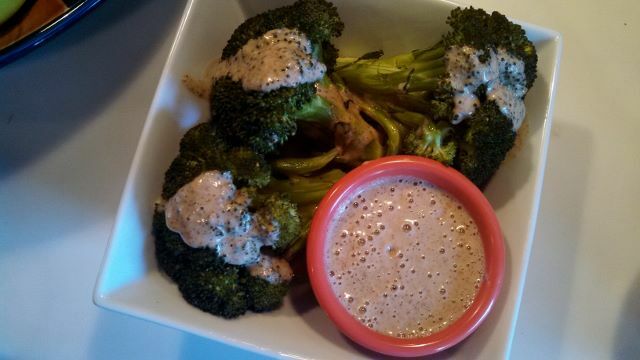 Use as a salad dressing, drizzle in a wrap, or as a dip for raw, steamed or roasted vegetables. 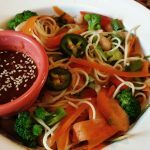 If you liked this article, check out Dr. LJ’s 15 Favorite Raw and Raw Fusion Recipes. Like us on Facebook for Daily Recipes for Life! In "Health, Nutrition, Tips & Tricks"
In "Miscellaneous, Raw Fusion Solution, Recipes, Snacks, Sweets"
LindaJoy Rose, PhD is a therapist, author, professional speaker, international trainer, and healthy living expert with over 25 years of experience. As the former Director of International Development for the American Board of Hypnotherapy, she is a pioneer in the field of subconscious dynamics and clinical hypnotherapy, implementing training and certification in many countries across Europe, Latin America and Asia. Dr. LJ has appeared numerous times as the Healthy Living expert with the Tampa NBC affiliate and syndicated Daytime TV show, local media coverage, and over 100 videos on the super-information site, eHow.com. She is the author of eight books, including Your Mind: The Owner’s Manual and Raw Fusion Living: Recipes for Health Eating, Natural Weight Loss and Anti-Aging, and contributes regularly to the popular worldwide news service, The Huffington Post. With a grant from the Astra-Zeneca Foundation, Rose successfully launched a healthy lifestyle retraining program at one of the nation’s largest and most respected clinics. Having overcome a debilitating auto-immune disorder through lifestyle changes and self-care, she subsequently developed a practical and delicious eating philosophy and teaches popular classes with food demonstrations, world-wide. 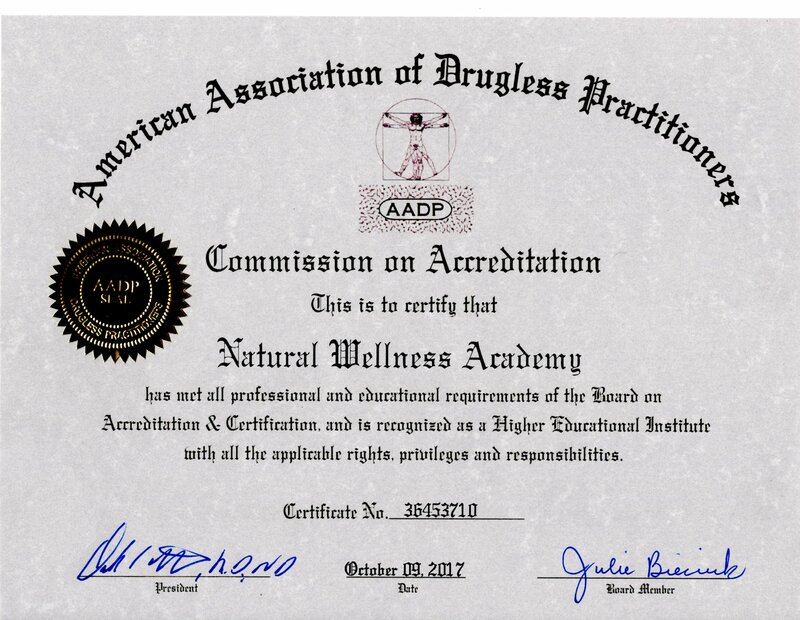 In 2013, she launched the online and onsite Natural Wellness Academy with certifications in Holistic Health and Life Coaching and Clinical Hypnotherapy and with students and graduates in almost 20 countries. The daughter of two Holocaust survivors, Dr. Rose is also a volunteer docent at the Florida Holocaust Museum and resides in Tampa, Florida with her husband and 4 furry companions. 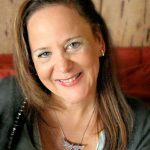 "From training therapists internationally in the fields of psychology and hypnotherapy to being an online mentor for two West Coast Universities, to founding the Natural Wellness Academy, teaching has always been my passion, I enjoy nothing more than informing and inspiring prospective coaches and therapists."